New York Roads - I-86/NY 17 I-86, NY 17 (for now): Southern Tier Expwy. E. River Rd. EB at Stanton Hill Rd, and vice versa (NB). E. River Rd. is former NY 283, and Stanton Hill road helps connect it to the rest of former NY 283 that was cut off by NY 17. 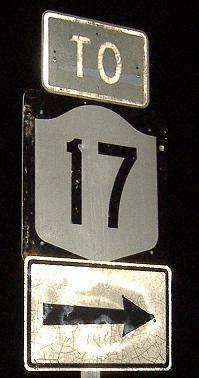 These cracked and non-reflective signs must date from the construction of the 17 freeway.